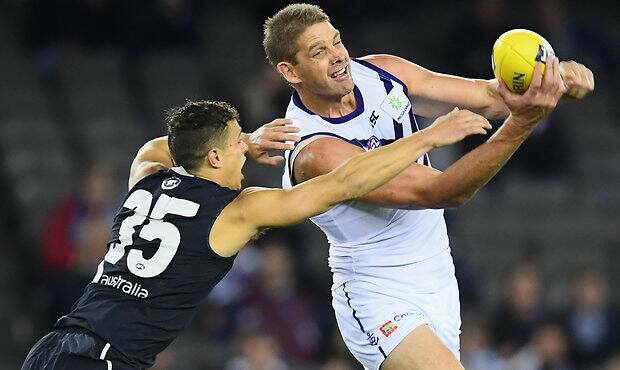 FREMANTLE remains steadfast warhorse ruckman Aaron Sandilands hasn’t played his last game, despite the 36-year-old’s ongoing calf trouble. Meanwhile, coach Ross Lyon is “really confident’ injury-ravaged Stephen Hill will make it back this season after repetitive soft-tissue dramas. FULL INJURY LIST Who’s ruled out and who’s a test? Sandilands remains without a timeframe to return on the Dockers’ official injury list after suffering another setback during pre-season. The 265-game veteran hasn’t played since hurting his calf during the warm-up before Freo’s loss to Brisbane in round 15 last year, and football boss Peter Bell told Channel Nine it was a “possibility” Sandilands wouldn’t be seen again. But Bell and Lyon are both backing the 211cm big man to overcome his latest issue. “I think he (Bell) spoke about possibility and where it’s at,” Lyon said. “It’s not something I’m looking at. I know he’s in rehab, he had a setback and our conditioners are confident that he’ll rehabilitate and play again this year, so that’s my understanding. “I think there was some nuance into the question that was asked by Matthew (Pavlich to Bell) and it’s a strict interpretation (that he might have played his last game). “I think the way Peter looked at it was logically, at the minute, he’s not available to play so he needs to rehab and get back and get to play, that’s how I’d interpret that. The reintroduction of the Mid-Season Rookie Draft after round 10 has added complexity to discussions around veteran players who might retire during the season and those on the long-term injury list who can be replaced. Sandilands and Shane Kersten (foot), both out of contract this year, currently don’t have timelines to get back to football. Hill, a prospective free agent, has had a nightmare run with quad and calf trouble since last year when he managed a career-low 13-game season. The 28-year-old is listed as six weeks away and unlikely to be seen before the round 12 bye. “Yeah, really confident, really confident (he will play this season). He’s a very special player to the Fremantle Football Club,” Lyon said. “It was really his quad we were dealing with and for whatever reason he’s ran into a bit of a calf issue in rehab. “We all acknowledge it’s disappointing, but we’re not running around yelling and screaming, we’re just working through and rehabilitating. Find AFL Exchange on Apple Podcasts, Google Podcasts and Spotify. The Dockers endured a disastrous soft-tissue record last season, sparking a review of their injury toll. So far this year, Griffin Logue, Connor Blakely, Sam Switkowski, Hayden Ballantyne, Brennan Cox and Stefan Giro have had hamstring dramas, while Matt Taberner and injury-plagued Harley Bennell have also suffered calf complaints. “We assess everything and try to improve everything. Soft-tissues are a fact of life, whether we’re more or less I couldn’t tell you because I just get on with the business,” Lyon said. “We’ve had a really competent strong team here for a long period of time. Bennell was due to undergo an MRI scan on Wednesday after concerns with his calf at training, but still hopes to play WAFL next weekend. “There was an initial ultrasound that (showed) no abnormality, but obviously he’s a little bit concerned so we’ll have a further investigation,” Lyon said. “They’re so finely tuned, athletes, particularly Harley, we’ll take no risk and get a further assessment today. Open an account with bet365 today and bet on a huge range of markets with the world’s favourite online sports betting company. Terms and conditions apply to all bonus offers and are not available to VIC, SA, NSW & WA residents. Check websites for details.